Selecting Option 520 provides a 250 kHz to 20 GHz frequency range for the PSG. Option 520 is required for signal generation applications that call for carrier frequencies at or below 20 GHz. Common uses include parametric and functional test stimulus generation for component and receiver test in point-to-point and point-to-multipoint broadband wireless communications systems, radar and electronic warfare systems, and satellite systems that operate in this frequency band. Save on premium quality used E8267D. Freshly calibrated, certified and guaranteed to work accurately right out of the box - no worries. Purchase easy knowing that your full warranty is backed up by our in house repair engineering department . Our military trained techs repair E8257D's at our world class lab. 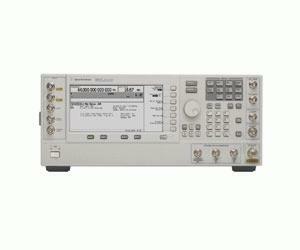 We absolutely know repair of Agilent signal generators.